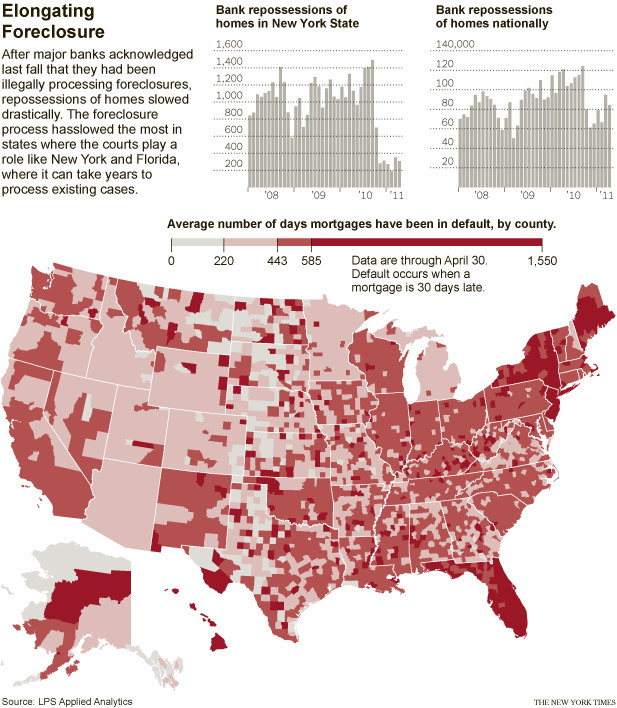 Today’s New York Times is reporting on a trend, which I have noted before, where lenders are sitting back and delaying foreclosures on homes in default. There are many reasons for the delay, including the lenders’ capacities to foreclose, the courts’ abilities to handle foreclosures, and the massive backlogs of real-estate-owned properties. The accompanying graphic shows Utah, once again, to be better off than many states. The lenders’ delays are adversely effecting associations, however, because owners in default on their mortgages are, more likely than not, going to be in default on their assessments, as well. This reality makes it more important that associations aggressively pursue assessment collections, rather than making the assumption– made by many associations — that the lender’s foreclosure will eliminate the ability to collect from the owner. Owners remain personally liable, and its likely, in this day and age, that you can collect before the bank will. ← Let the Registrations Begin!